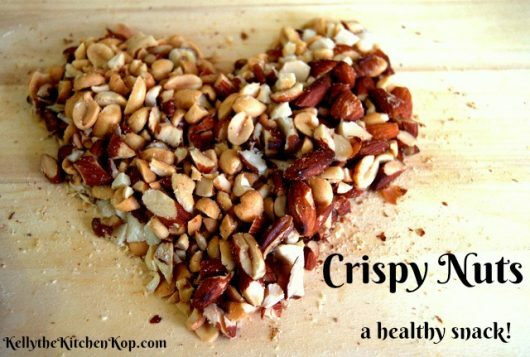 Recipe for Crispy Nuts – A Nutritious Snack! My whole family likes to snack on nuts. 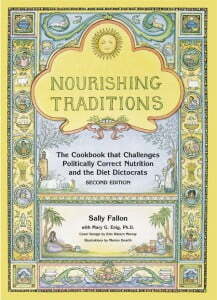 Thankfully they are good for us (read about why this is true below), and this recipe from Nourishing Traditions is an easy way to make them even more nutritious. 4 cups pecans, almonds, peanuts, macadamia nuts, walnuts or even pumpkin seeds (I do pecans, almonds & peanuts most often) – NOTE: you can also use cashews, but only soak those for 6 hours. Find raw nuts online here. Mix above ingredients together in a glass bowl, stir and leave on the counter overnight, at least 7 hours. Drain well in a colander and spread onto a buttered cookie sheet (4 cups are just right for one cookie sheet). Sprinkle with sea salt. Bake at 150* for 24 hours, depending on how crispy you like them. I keep them in the freezer (freezer baggie) and they are good for months. These are great to have on hand for a quick healthy snack, for school lunches, or for recipes. NOTE: Unfortunately my oven only goes down to 170*, so I was told in this case the phytic acid is still broken down, but any enzymes will be cooked off (so in that case, I may as well bake them at a bit higher temp for less time in the oven to save energy). If you have an oven that goes down to 150* or a dehydrator, that's much better, but soaked nuts are still MUCH preferred to unsoaked. As a matter of fact, if I eat regular nuts now (I ate them by mistake recently), I get a terrible stomachache. Why are these healthier than just eating a handful of any old nuts? Nuts contain phytic acid, which binds with minerals (calcium, magnesium, iron, etc.) and prevents them from being absorbed by our bodies. The same is true for all grains, here's more information on soaking, sprouting or fermenting whole grains to make them more nutritious. Nuts also contain something called enzyme inhibitors – read more about that at Kimi's post. NOTE: my sister in law loves eating raw almonds for the high vitamin E content. I did some checking to see if this recipe would destroy the vitamin E. Looks like vitamin E is fairly heat stable! It is destroyed with higher heat (frying, deep frying, etc. ), but can withstand lower levels of heat well. Or even better, try these chili lime almonds. Have you heard of Weston A. Price? I like crispy nuts soooo much better than raw or regular roasted. Hi. . Is that 150 temp ferenhite or Celsius? You just have to get them to the crunchy stage, I’m sorry yours burned!!!!! If my oven goes down to 200* but has a ”warm” setting, how long do you estimate leaving them in the oven? Do you have to stir them at all, or could I set them going before bed and hope for the best? So “warm” is lower than 200* or that IS the warm setting? Either way, overnight they’d be fine. I usually do give them one stir, but it’s not absolutely necessary. Depending on your oven temp, overnight probably won’t be long enough to get them crispy. Just test them and see if they have a nice crunch in your mouth. If not, they need to go longer! I’ve talked about omega 6/omega 3 ratios in my CLO posts mostly, but yes, too many omega 6’s aren’t good. Most people have a ratio that’s way out of whack due to all the vegetable oils, grain fed meat, etc. in our diets. To counter this, avoid modern vegetable oils and conventional meat, and just be sure you’re getting LOTS of omega 3’s from CLO, pastured meat & dairy, fish, etc. Any thoughts on sun-drying the nuts after soaking? So now I’m wondering not only if it is impossible to get raw almonds in the States, but truly raw nuts anywhere? I’m at a loss, as TJ’s was my “source”. Where do you all get authentically raw nuts? I’m eating raw, soaked, sprouted organic nuts from a source I haev not been able to duplicate: Wilderness Family Naturals. Not cheap, buy in bulk to save on shipping, but they taste great – they have a great almond/walnut/acshew/pecan mix. Anyone know how long to do them in the dehydrator? I just recently purchased a dehyrator because I can see us using alot of these. My nuts are soaking now and I’m planning on putting them in the dehydrator tonight. If you do 24 hours at 150 degrees, I’m guessing it will be longer. Love, Love, LOVE this site!!!! Penny, thanks ya big sweetie. For the nuts, I don’t know on timing (can you believe I still don’t have a dehydrator?! ), but what I do when they’re in the oven is just keep popping one in my mouth when I know they’re getting close and see if they’re crispy enough – yum! I rarely spend the money on organic nuts, either, so basically I just buy the nuts in bulk at my local health food store and soak those. You’ve caught me smack in the middle of trying to figure out all this about nuts, too. I want to make my own nut butters, but didn’t have good luck with peanuts, so I planned to try almonds. Now I can’t figure out what to buy or where to buy them, and Kimi’s recent post (https://www.thenourishinggourmet.com/2009/09/q-a-should-we-soak-almond-flour.html) only confused me more! When I have a chance to do more research on this and figure it all out, I’ll do a post on it then. I’m buried right now so it may be a while! In the meantime, if you figure anything else out, let me know, OK? What about cashews? Do they have to be soaked too? Could you use a dehydrator instead of an oven? We all LOVE the pecans the best, the kids included. You could try those instead. Look what I just found!! I used almonds and walnut and they were delicious! This even helped eliminate the bitter flavor that walnuts tend to have. Has anyone made a sweetened version? Thanks Amy, and I wish MY oven had a “keep warm” feature! Keep up the great work – what I great site! I have the same issue of sitting way too much at this computer. I’ve been keeping an eye on the scales since I began working on this blog last fall, and I also TRY to watch my portions…OK, and also my sweets consumption! But like you said, nuts are a great, quick, healthy snack when I don’t want to sit down to a full meal. Kelly – your blog is truly a gem. Whenever I pop in I can read something interesting and be inspired to post. Speaking of nuts – almonds are arguably Nature’s perfect food. I might argue that milk is, but almonds rank right up there. My favorite breakfast for the past few years has been coffee/cocoa/cream & maple syrup sipped with a dozen raw soaked (3 days) whole almonds. This is nearly to sprouting and neutralizes the inhibitors you speak of above. As a person eats more nutrient-dense foods, quantity ceases to be necessary, I’ve found. Besides, my hips don’t need any more for breakfast – I spend too much time at the computer terminal to eat much more.